Inrush current or input surge current refers to the maximum, instantaneous input current drawn by an electrical device during its initial turn on. Power converters also feature high inrush currents relative to their steady state currents that may be several times their normal full-load current when first energized. The inrush current of a power converter is typically the charging current of the input capacitance. Inrush currents can be problematic in circuits that utilize overload protection devices such as fuses and circuit breakers. The selection of overcurrent protection devices is made more complicated when high inrush currents are present. False overload conditions can trigger unwanted protection events. In installations where multiple DC/DC converters are powered by a single higher power converter installed “upstream”, multiply simultaneous inrush currents from the downstream converters can cause the upstream converter to go into overload or short circuit protection, resulting in a complete shutdown of the power distribution circuit. 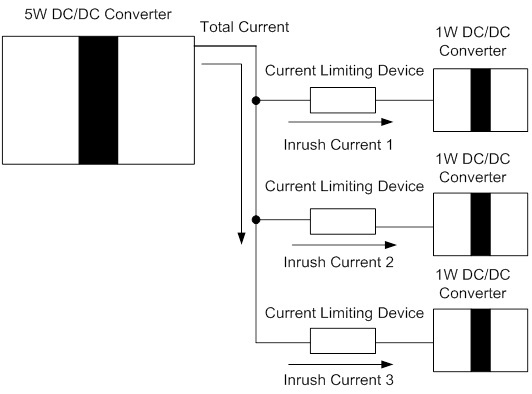 See Figure 1 Here the total current drawn from the 5W upstream converter is the sum of the three inrush currents. There are three passive components that can be installed at the input to the converter that will help reduce the inrush currents: resistors, inductors, and thermistors. A resistor in series with the line can be used to limit the current that is charging input capacitors with typical values of between 0.5O to 1 O. This approach is not very efficient, especially in high power devices, since the resistor will have a voltage drop and dissipate some power. The second way to help reduce the inrush current is by installing an inductor in series with the line with typical value of 47µH will also limit inrush current. The third option in limitingInrush current is to use inrush current limiters. Negative temperature coefficient (NTC) thermistors are commonly used in switching power supplies to prevent damage caused by inrush current. A thermistor is a thermally-sensitive resistor with a resistance that changes significantly and predictably as a result of temperature changes. The resistance of an NTC thermistor decreases as its temperature increases. When the thermistor is “cold” its resistance value is high limiting the input current to the converter. As the current flows through the thermistor its temperature increases and its resistance value will decrease allowing normal stead-state current to flow. A typical value for a thermistor is 1O ± 25%, with Max Steady State Current of 40A.